A funeral mass is scheduled for 10 a.m. Monday, Sept. 18, at Our Lady of Grace Catholic Church for Guadalupe Garcia Hernandez of Artesia. Hernandez, 76, passed away peacefully Thursday, Sept. 14, 2017, at her home, surrounded by her family. Interment will follow the services at Woodbine Cemetery. Pallbearers will be Anthony Garcia, Louis Garcia, Matthew Hernandez, Cilio Hernandez, Fred Olivas, Jessie Olivas and Anthony Lara IV. Honorary pallbearers are Jessie Olivas Jr., Devon Olivas, Emilio Garcia, Angel Natera and Jared Hernandez. A rosary will be recited at 6:30 p.m. today. Lupe was born Sept. 22, 1941, in Eddy County to Manuel and Mercedes (Cortez) Garcia. She was a hard worker all her life. As a teenager, she worked at a little store in the Cottonwood area. She was a member of the Daughters of Mary at Our Lady of Grace Catholic Church. On May 9, 1961, she married the love of her life, Frederico “Lico” Hernandez. Their witnesses were Eliadoro B. Hernandez and Nell Phillips. On April 4, 1964, the couple sealed that bond with a church service at Our Lady of Grace, joined by Jose and Maria Galvan as their witnesses. 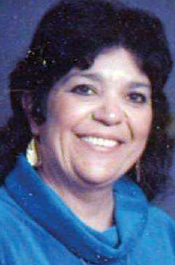 In the late 1960s, Lupe was appointment director of the Home Education Livelihood Program (HELP), the only Hispanic woman to be appointed director of this program. The appointment was a huge step for Hispanic women during those years. She was in charge of three sites: Cottonwood, Hagerman and Atoka. Lupe was highly respected by the men she supervised, including the board, which consisted of farmers within the Hagerman, Cottonwood and Atoka areas. Her directorship duties included procurement of sites in training the farm workers or migrants in trades or crafts that could be used to earn additional monies than that of a farm laborer. New housing was also a part of that program, helping people who could not have otherwise been able to afford a new home. Singing was one of many things Lupe loved, and she had a beautiful voice. Even on those last days, her sister Mary was able to get her to sing a little tune. She also had glamour about her, always having the latest hairdos and fashions, along with great looking jewelry. One niece states that her tia reminded her of Elizabeth Taylor, as she would glide along the floor when she walked across. A very active member of the Moose Lodge in Artesia, Lupe would recruit people, including her children, nieces and nephews, to work their annual Halloween carnival. She was also involved in helping with the Christmas party for children. As a member, she attended conferences in Philadelphia and Las Vegas. Survivors include her husband, Frederico; children Celestino Hernandez and wife Loraine, Rosie Garcia and husband Luis, Lola Muniz and husband Doug, Sylvia Hernandez, and Anthony Lara; 11 grandchildren; 20 great-grandchildren; a special goddaughter, Renee Hernandez-Scott, to whom she was very close; sisters Esther Rodriquez and husband Willie, Elma Samora, Mary Padilla and husband Frank, and Estella Flores and husband Albert; brother Alfred Garcia; and numerous nieces and nephews. She was preceded in death by her parents, Manuel and Mercedes Garcia; three nephews; and one brother-in-law.